Will India get the Hyundai i20 'GTi'? Considering the fact that the world is facing an economic crisis, when else would a hot hatchback sound more relevant? Hot-hatchbacks have always maintained dual roles- that of a city run about and a car that offers cheap thrills. Now that these hatch's are getting much better, this might just be the right time to buy one. Following the hugely successful VW Golf GTi, Renault Clio Cup and all the various hatches available out there, Hyundai is considering launching a hot-hatch version of its soon to be launched i20 hatchback. Even Skoda has announced its interest in bringing the 'vRS' version of its Fabia hatchback. The performance-orientated i20 would be the Korean maker’s first step into the modern hot hatch market, but an i20 ‘GTI’ could still fit into the range provided it stuck to the Hyundai budget philosophy. “It’s on the cards, and would be a boost to brand image in the UK,” a product development insider told, although he added that no firm decision had been reached. The warmed-over version of the i20 would use Hyundai’s 1.6-litre diesel engine, which won’t be offered otherwise in Britain. With the boost turned up, this unit could offer around 200bhp.That is the same engine that will most likely be available in India but only in a normal state of tune, even then it offers a healthy 116bhp. That wil still make it the most powerful in its class. However, it will be vital for Hyundai to keep fuel consumption and CO2 emissions as low as possible if the proposal is to reach showrooms. It is understood that the company would like to offer a warm performance hatch with sub-120g/km CO2 emissions, and aim it at younger buyers. It would be a direct and potential rival for the Skoda Fabia vRS, and could start under Rs 7lakh as we already know that Hyundai's diesel engines are imported and hence will be quite expensive. Hyundai says that, as the diesel i20 has a reasonably low kerb weight of 1222kg, it wouldn’t need a great deal of power to turn in a sub-8.0sec 0-60mph time and post a 130mph (210kmph) op speed. But by using a reworked version of the frugal diesel, it could still offer ultra-low running costs. The hot i20 would probably get larger 17-inch wheels, bigger brakes and a body kit, and it would ride lower to improve the handling. One of Hyundai’s chassis development team told us that adjusting the i20’s set-up for a sportier drive would not be difficult. However, one problem holding back the project is tyres. Hyundai would need a partnership with a sports tyre manufacturer to provide rubber for the hot i20 – and that’s something that it still lacks. IAB Comment- So can it ever be expected in India? I guess the chances are bleak but there are a lot of people out there who would rather take a hot-hatch rather than a sedan. 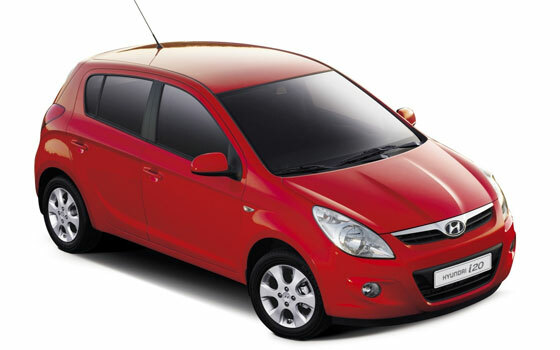 So Hyundai, if you are reading this, bring the i20 'GTi' to India as well! Case study- VW Up! will be built in a place called Bratislava; Will it be built in India as well?